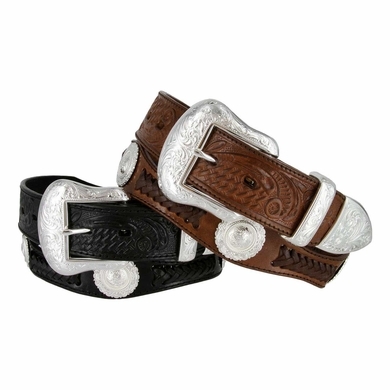 Embossed leather western scalloped belt with hand-woven leather cord and edge stitching, featuring floral engraved buckle set and center-rope conchos. Number of conchos may vary depending on size. 1 and 1/2" wide, with snaps for interchangeable buckles.